It has been way too long since we last pulled out the sidewalk chalk! And since it’s too cold to play outside, what better way to use it than in an awesome Christmas art project! We don’t have a sidewalk in front of our house and our driveway and patio are made from interlocking brick. So it’s kind of hard for the kids to get overly creative with sidewalk chalk in the summer. Our patio ends up looking like a giant mosaic, with each brick coloured a different colour than the one next to it. Which is cool, but kind of limits their creativity. The kids LOVED that I let them play with the chalk inside the house! And they seemed to love that they could actually draw pictures with it! 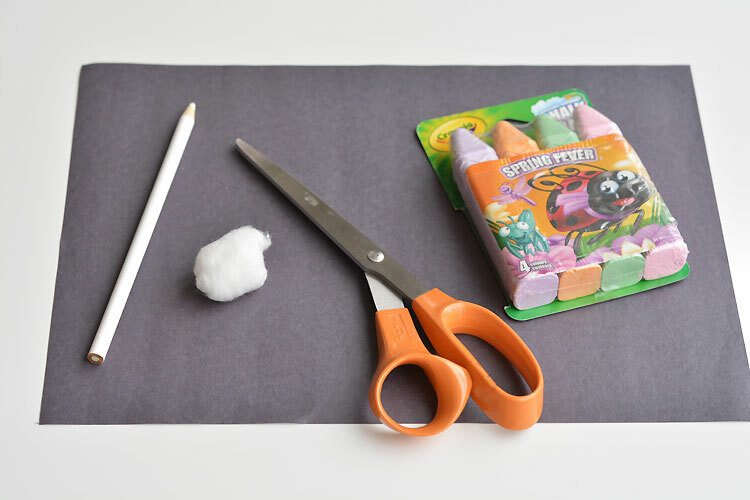 If your kids are going stir crazy over the holidays and you need an activity to keep them occupied, just give them paper and chalk and it’s like magic! That is, if your kids are crazy into crafts like mine are. I got the idea for this art project from Buggy and Buddy and it’s brilliant. Seriously, so awesome and so fun! Her lights turned out even better than ours, so I definitely recommend heading on over there to take a peak! I’ll wait here, I promise! I didn’t have a silver marker, so we just used a white pencil crayon. 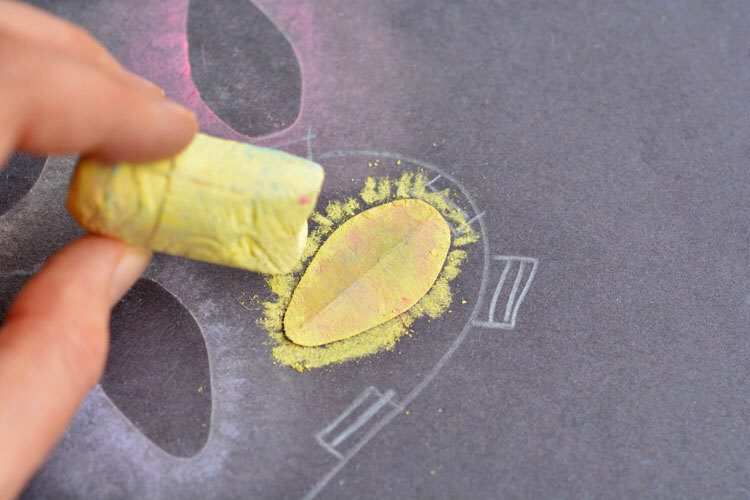 The white pencil crayon rarely gets used in our house, but it was totally perfect for this! 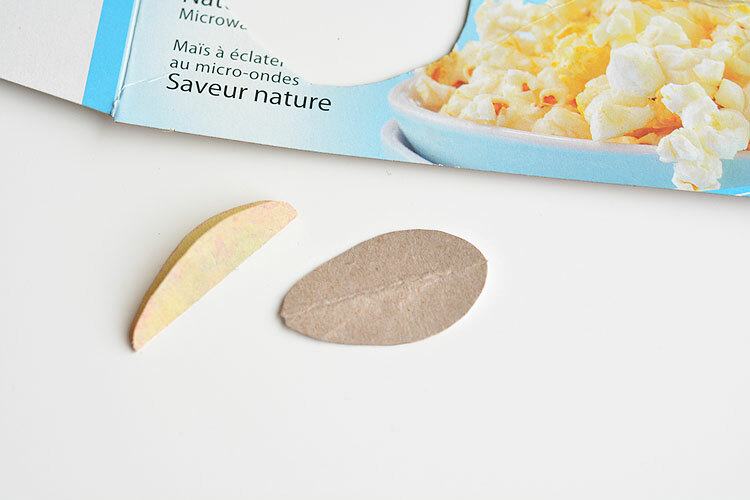 I tried making the stencil for the light bulb both out of construction paper and out of an empty microwave popcorn box. Both worked well, but the cardboard one was a lot easier to keep in place. 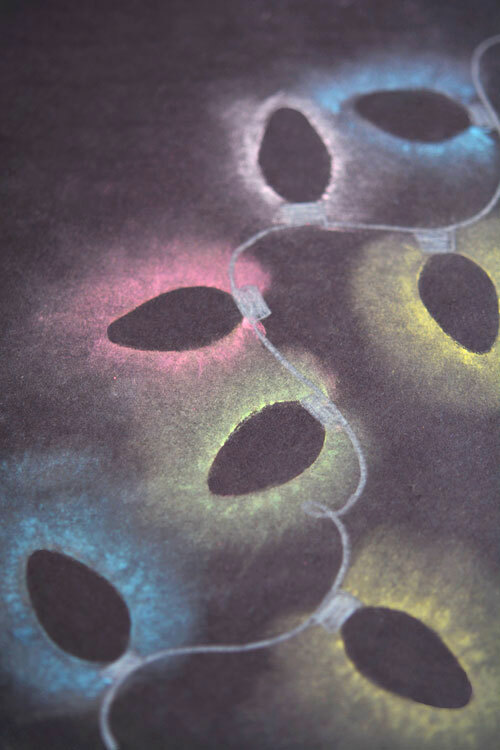 Start by drawing a swirly line for your string of lights and add in some little rectangles for where the bulbs are going to go. I’d recommend going over the string twice with the white pencil crayon just to get the colour to really show up well on the black. 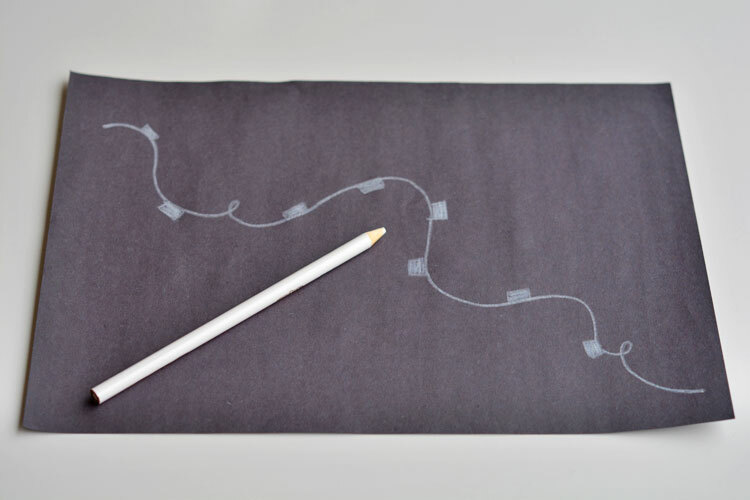 And when you pull off the stencil, you’ll have a perfect outline of a glowing light bulb! 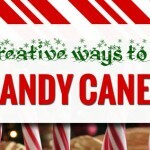 We tried this with Christmas trees and stars too, and it looked awesome! My 3 year old didn’t have the patience for the stencils, so this would probably be more fun with older kids (or grown ups… just saying…). 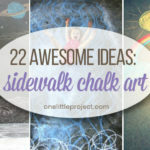 But she sure was happy getting to use the sidewalk chalk for an art project, whether it was stenciled or not! Try not to look too closely at her clothes… It was pajama day at school for my 5 year old, so my 3 year old decided to put her pajamas back on over top of her clothes for the day. When you continue along the whole string of lights it looks so neat! The finished project is so cool! 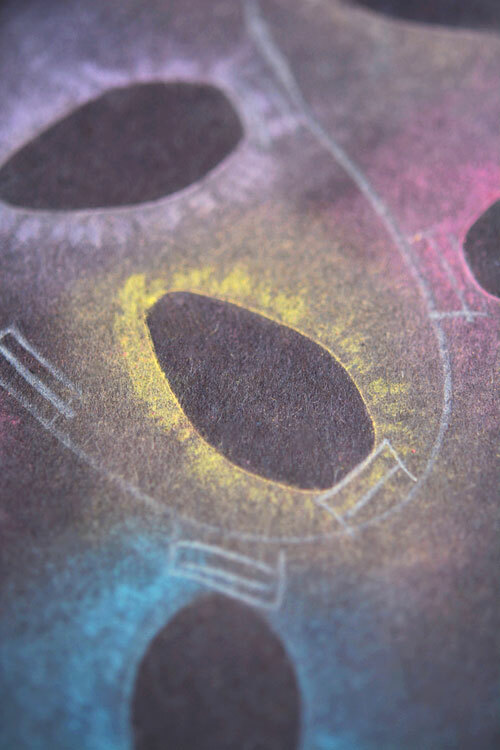 This will work on any colour of paper, but you’ll get the most dramatic results on black paper. My kids refused to use anything other than yellow and blue paper. But it still showed up really well. 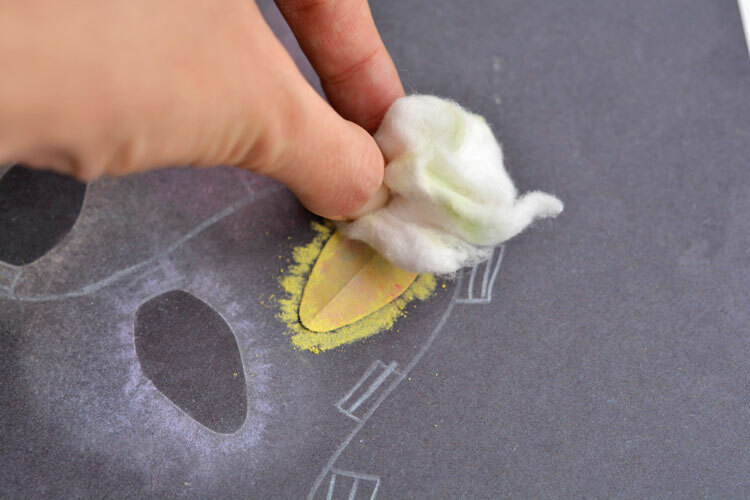 They do smudge fairly easily, so if you hang them up, make sure they are far out of reach from curious fingers, or put them in a frame behind glass or plastic so the chalk outlines are covered. I’m definitely going to try this again for other holidays! It would be awesome with hearts for Valentine’s Day. And just imagine how amazing it would look for Halloween if you made a jack-o-lantern stencil!? 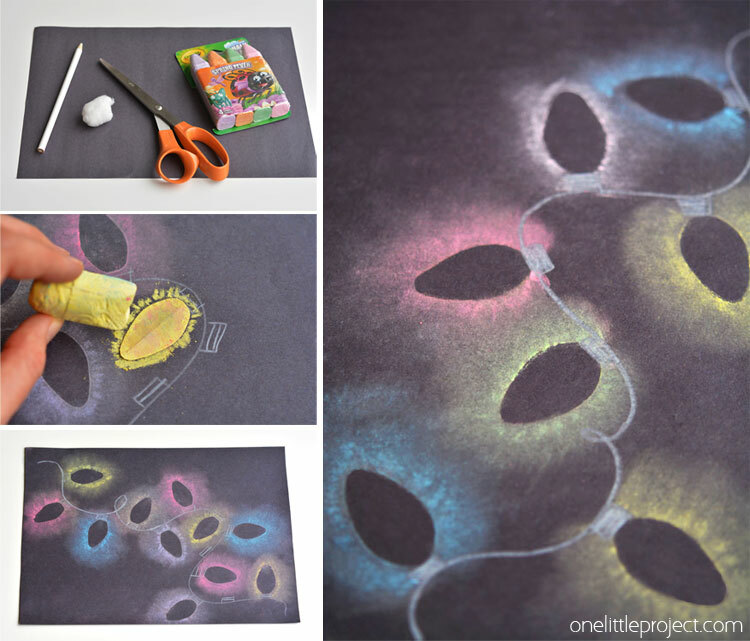 These chalk Christmas lights are so easy to make, and the effect is really cool! It looks just like the light bulbs are glowing in the dark! 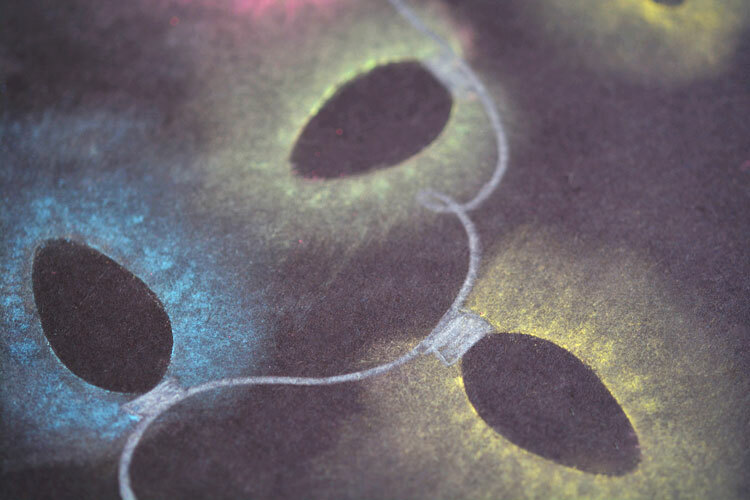 The brighter the colours of your chalk, the better. And if they are broken scraps like ours were, no problem! 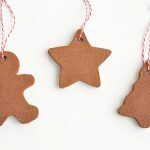 This is such a fun craft to do with the kids while they are home for the holidays! You can lightly spray with hairspray and they won’t smudge! That’s a great tip!! I’m definitely going to try that!! Thanks! Thanks for linking up to You’re gonna love it. 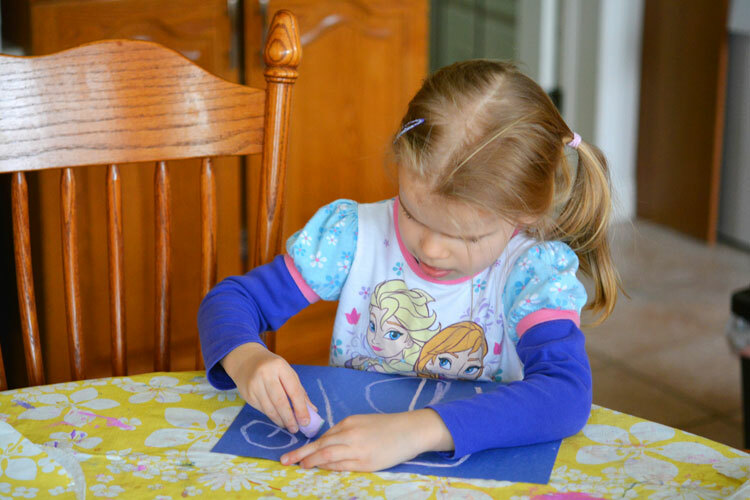 I loved this project so much it is my featured post this week! 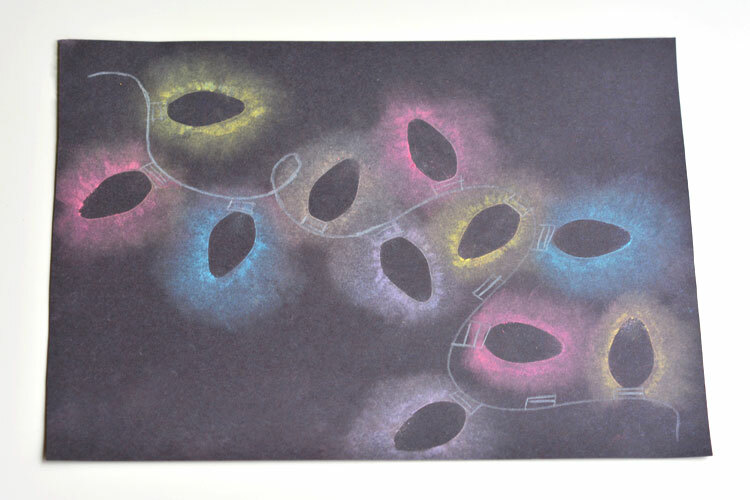 Would the effect be the same on an actual sidewalk or is it the black paper that really makes the difference? 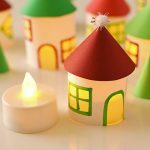 This is so cute, if you were in a moderate climate where the sidewalks remained dry during the holidays it would be fun to make a path to the front door for a party, or to light Santa’s way! In fact, do they make glow-in-the-dark sidewalk chalk?